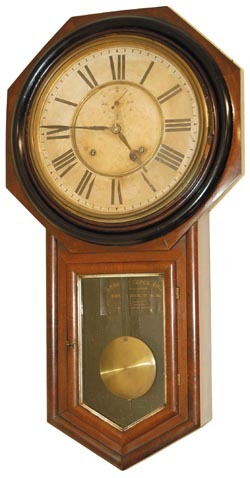 Ansonia Clock Co. "Office Regulator", C. 1901. Excellent black walnut case with the original finish, the polished case has been rubbed leaving a nice sheen. Some finish has worn off around the brass dial ring and bezel. The dial is original, darkened slightly as paper dials will, particularly after 100 years of use. Putty around the top glass is original and largely still intact. As usual we see wear on the gold-silver around the bottom glass. There is a near perfect black label, inside the case. This fine 8 day, half hour striking clock, appears to be 100% original, and is running nicely. Ly-Ansonia #655.